from * to * to last dc, work 2dc in last dc, sl st to top of ch3 on beginning of row. Fasten off. (139dc + ch3) Put to one side and we will come back to later. Next Row - Working through both loops ch1, 1sc in base of ch1, 1sc in each sc to end. Turn. Rpt last row 3 more times, making 5sc rows in all. Turn. un-worked for opening. Turn through to right sid e.
in next loop, * rpt from * to * to last loop, skip last loop, sl st to first sl st. Fasten off. Rpt Shell Edge on back of bag. Fasten off. (by opening) ch170, make sure not to twist ch, sl st to opposite side of bag on centre of side panel, working back along ch's work 1sc in each ch to end, sl st to panel. Fasten off. 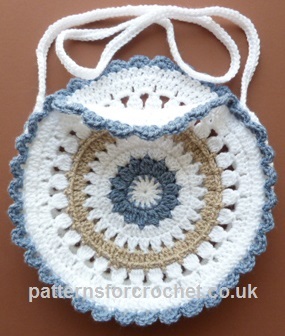 Hope you enjoy this free crochet pattern for a round shoulder bag.